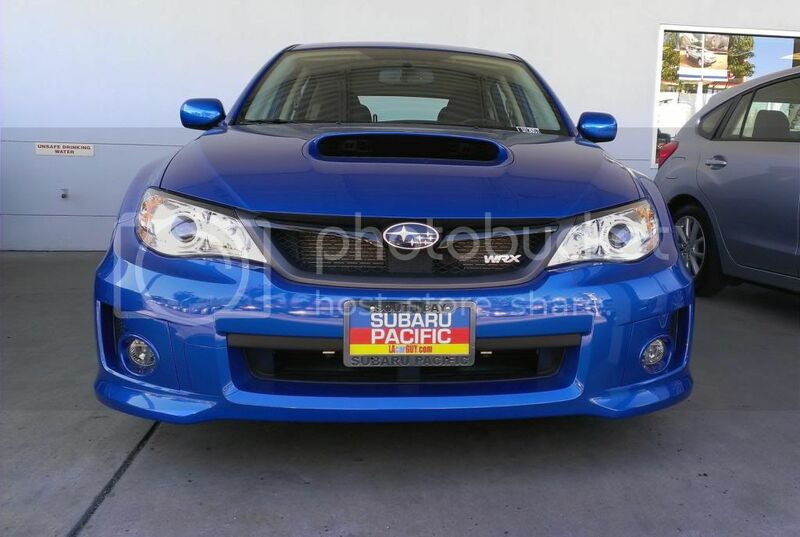 Since model year 2011, Subaru has given the WRX the STI treatment, by adding the STI's wide fender flares, larger hood scoop, quad exhaust and wing spoiler. In sedan form, the look has always seemed a bit much to me, but for some reason, it looks more fitting on the hatchback. I really like that the WRX hatchback looks aggressive and sporty without looking too much like a boy racer's car. The gunmetal colored, 17 inch alloy wheels offer a sporty touch and do a decent job of filling up the wheel wells. This test car's addition of the fog lamp kit not only helps with inclement weather visibility, but adds to the rally-inspired look of the car. Of course, looking sporty and not being about to back it up is extremely pointless. For the WRX, this is definitely not the case. Both the sedan and hatchback come equipped with Subaru's 2.5 liter, turbocharged, horizontally opposed four cylinder boxer engine. This engine puts out a very hearty, and possibly slightly underrated, 265hp and 244 lb./ft. of torque. In this particular car, the engine is mated to a five-speed manual transmission equipped with the STI short throw shifter kit. The turbocharged boxer engine makes driving this car a hoot! Acceleration feels extremely quick and the exhaust puts out that distinct flat four wail that can only come from the boxer engine arrangement. The WRX is not just good at going quick in a straight line though. Subaru has done a fantastic job of tuning the chassis, suspension, and brakes of the WRX. Driving over bumpy roads is relatively painless as the suspension does a fine job of soaking up any wayward bumps or pot holes. Take a turn at a fast pace though, and the car clings to the road. While cornering, you can tell that the chassis is well-sorted as there is very minimal body roll and the car feels confident and planted all the way through the corner. Despite being fitted with Subaru's full-time AWD system, or perhaps because of it, the chassis is well balanced and offers tremendous feedback. To top it all off, the WRX also has some fantastic brakes that grab pretty hard and can haul the car down from speed quickly. It is no wonder that this car has been a rally driver favorite for so many generations. All this talk of the car handling well is no good unless the driver can feel what the car is doing and provide the proper input to keep the car pointed where it needs to go. In this case, Subaru has done a good job with the steering. Thankfully, Subaru has opted to stick with a hydraulic steering rack, rather than switching to electric like most manufacturers are doing these days. The WRX's hydraulic rack does a fantastic job of communicating with the driver to keep him in tune with every detail of the road. Not once during my test drive did I not know what direction the wheels were pointed or feel nervous about turning the wheel. There is one minor flaw with the steering in that it is a little light, but the great amount of feedback made me not notice the light steering at all as long as I was not driving around in a parking lot. Being a hatchback, one would expect this car to be practical, and it is. The WRX in hatchback form offers 44.4 cu. ft. of space with the rear seats folded flat, and 19 cu. ft. with the rear seats in their upright position. That is definitely quite a lot of space, and Subaru offers accessories to add to the practicality of this car, such as bike racks and roof carriers. 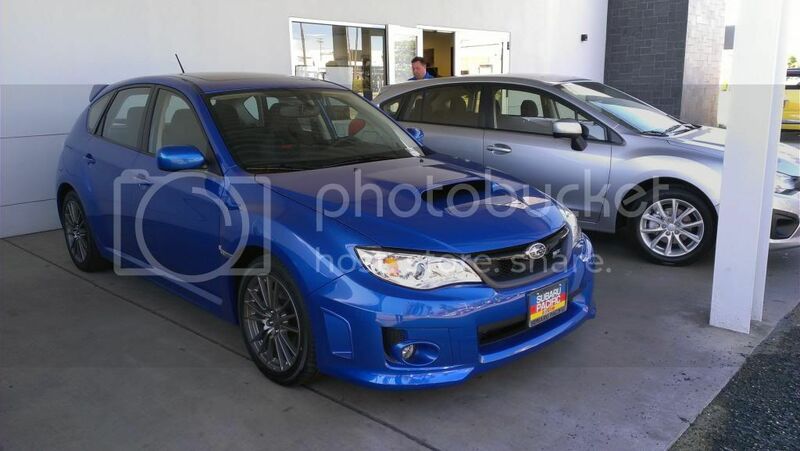 The Subaru WRX is not exactly a cheap car, despite being based on the relatively pedestrian Impreza. Some of that cost can be attributed to the standard AWD system, but considering the cost of the vehicle, it seems pretty clear where Subaru decided to spend the extra money. Here is a hint: it is not the interior. The one glaring flaw of the WRX is its rental car cheap interior. Plastics are hard, flimsy, and cheap feeling. Buttons feel like they would break and wear after long term use. Even the surprisingly comfortable seats are ruined by a somewhat rough feeling cloth. Sure, you can easily address some of these issues by spending an extra $2000 to opt for the WRX Limited, but the leather seating surfaces in the WRX Limited do not correct all of the issues I had with the interior. One bright spot in this rather dreary interior is its leather wrapped steering wheel. The steering wheel did feel like it was covered in a decent material, and felt good in my hands while driving. 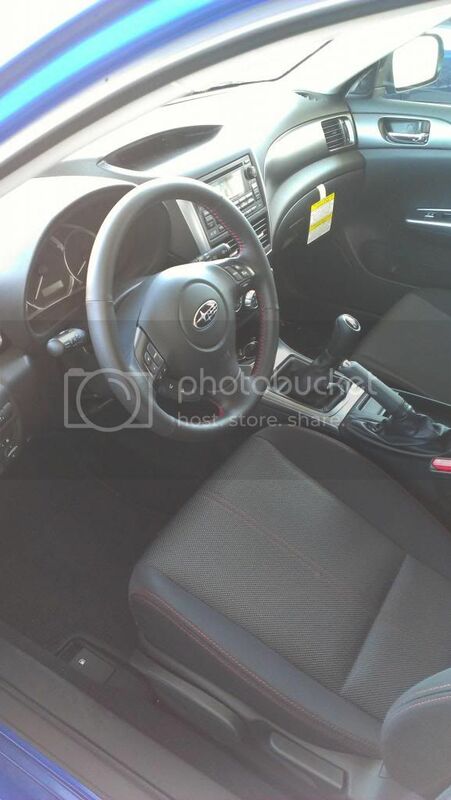 Now if Subaru would have only made the rest of the interior as good as the steering wheel, I would be less critical. It is definitely a bit disappointing when a $16,000 Honda Civic LX has a more upscale feeling interior than a $27,000 Subaru. Another problem I had with the car was with its transmission. Oddly enough, when I test drove the sedan model of the WRX a few months back, I did not have a problem with the transmission at all. Shifts were fairly clean, throw distances were not too long, and the shifter had enough resistance to not make it feel dull. However, this model was equipped with the STI short throw shifter kit, which for some reason ended up ruining the positive feelings I had about the transmission in the sedan. For one reason or another, the short throw shifter kit made shifts feel plasticky and dull, much like the transmission in the 2013 BMW 328i we tested a little while back. Also, despite being called a short throw shifter kit, shifts did not feel noticeably shorter than when I drove the sedan with the regular 5-speed. Granted, I may be biased since my S2000 has some very short shift throws, but I feel as a $300 accessory, it hardly seems worth it. Finally, the biggest downfall of the WRX is its fuel economy. Looking at the dismal fuel economy numbers on such a small car makes me cringe in disappointment. While I realize that economy is probably pretty far down the list of priorities for Subaru, it is something that more and more buyers are demanding and the competition is offering. Several cars that offer similar power ratings also offer substantial fuel economy benefits, so it is not a matter of the technology not being there, but rather a matter that Subaru is not yet including it in its engineering. I like the Subaru WRX. It is a car that drives well, is practical, and looks relatively nice. Sure, I do wish it had a slightly more upscale interior, but I understand that certain compromises need to be made in order to build a car that performs well too. Having driven an S2000 daily for the past three years, I definitely understand compromise. Special thanks to Subaru Pacific in Torrance, CA for risking the life of one of their salesmen and allowing me test drive their car. This car can go 0-60 in 4.7 seconds. Look at the fuel economy of other cars that can go 0-60 in 4.7 seconds. That's totally fair, but the Porsche Boxster S with the PDK transmission has the same 0-60 time and does 21/30 mpg. It is a combination of the high performance and AWD, which not everyone needs. It is a trade-off, but should be considered when making a buying decision. That said, there is no doubt that the WRX is a great car in its own right, but there is definitely still room for improvement. The Porsche boxer S is $60,000. Different price class. Sure, different price class, but only Subaru and Porsche are using the boxer engine layout, and Porsche has, through the use of direct injection, greatly improved the fuel economy and power output of the engines while Subaru is still stuck at least one generation behind at the moment. Hopefully, the upcoming version of the WRX will see some dramatic fuel economy improvements since the regular Impreza saw a massive jump when the latest generation car was introduced.